Want to learn more about Rise of Shadows ? Head on over to our Rise of Shadows guide! Join the discussion on our forums! Come discuss Keeper Stelladris over in our dedicated Keeper Stelladris discussion topic. 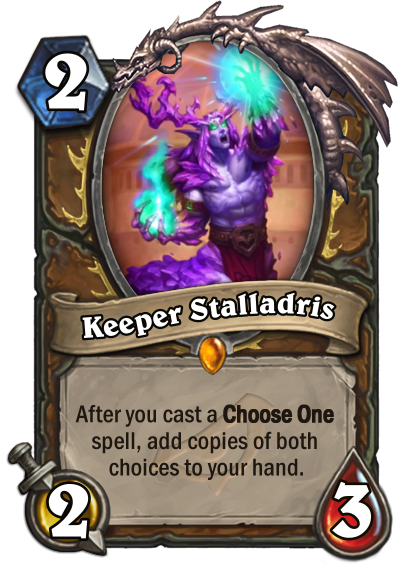 After you cast a Choose One spell, add copies of both choices to your hand. Lol I do that constantly too...accidently crafted some garbage that way too. I get really paranoid when Im looking at golden legendaries. Just tried this for heal druid and lots of choose one spells and this is bonkers! Draw it with Jepetto Joybuzz. What about Wardruid Loti? All four extra beasts? Chances are Jade Idol shuffles 3 copies of Jade Idol, but the wording could mean that it shuffles copies of the shuffle copy option and not actually Jade Idol. That'd be stupid but kind of hilariously anticlimactic. The final reveal stream confirmed that some of the older Choose One spells will have new names and artwork for their two choices now that this guy can add them to your hand as spells. Wrath, for example, is now split into Solar Wrath (the 3 damage) and Nature's Wrath (1 damage + draw), each of which has its own artwork. More recent Choose One spells (such as Mark of the Loa) do this already so they likely won't be changed (other than the mana costs of the choices being updated to equal the original spell's cost). On a less silly note, it's been no less viable in Wild since it first came with Gadzetzan, being the ever present terror till today. This is but another small upgrade to make it even more harrowing. Obvious auto include. I guess maybe in an aggro Druid deck it's not that good because the choose ones are not that powerful, but who knows. A very versatile card, its effect and cost allows you to put it in decks from aggro, to mid-range and control, I think it will be a definitive card for any competivive Druid deck this year.